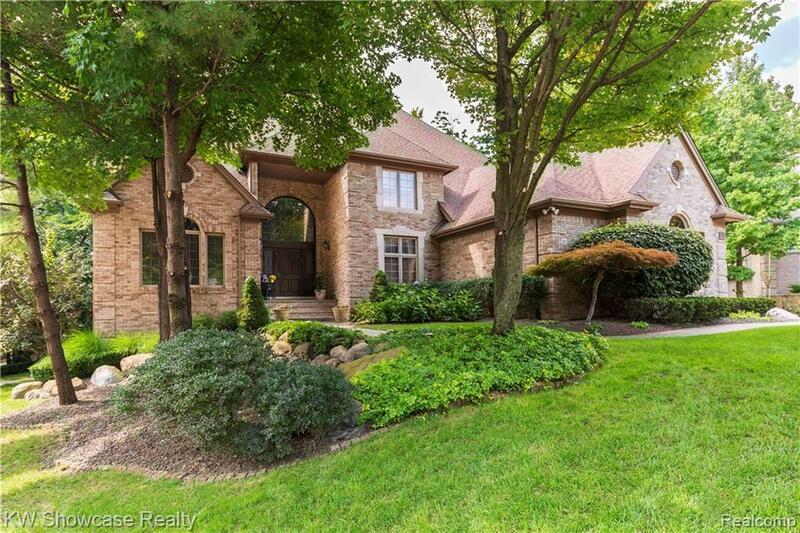 Elegance Awaits You, Magnificent Brick Colonial on Cul-de-sac in Prestigious Oxford Estates. Over 5400 Finished SF w/4 Beds, 3.5 Baths, 3 Car Garage, & Finished Walkout Basement. Grand 2 Story Foyer, Hardwoods throughout 1st Flr, Home Office w/Built Ins, Formal Living Room w/Vaulted Ceiling & Fireplace, Formal Dining w/Built in Buffet. Crown Molding Throughout. Eat in Kitchen w/Huge Island & Nook, Custom Cabinets, Granite Tops, Dbl Oven, High End Appliances, Huge Walk in Pantry & Butlers Pantry. Family Room off Kitchen w/Fireplace & Dbl Doors to Deck. Master Suite w/Hardwoods, Architectural Tray Ceiling, His & Hers WICs, Jetted Tub, Custom Tiled Shower w/Euro Glass. 3 More Bedrooms up w/Full Bath. Finished Walkout Bsmt w/Wet Bar, Fireplace, Workout Room, Full Bath, Prepped for Kitchen, Lots of Storage. Large Attached 3 Car Garage, w/Mudroom, & 1st Flr Laundry. Professionally Landscaped, Brick Paver Drive & Walkway, Private Lot, Refinished Deck Overlooks Woods. Close to Freeways.